Facial rejuvenation acupuncture supports overall health focusing on the face to bring out one’s inner beauty. 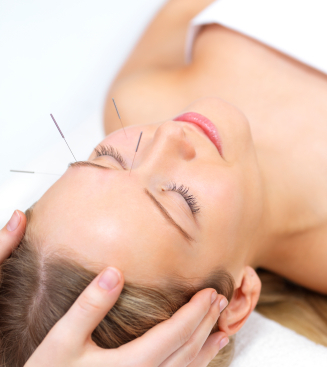 Acupuncture for beautification has been used for thousands of years by women in Asia. Facial acupuncture increases the elasticity of the skin, tightens pores, improves muscle tone and dermal contraction. At Isthmus Wellness we practice constitution facial acupuncture to address the root causes of accelerated aging while beautifying the face. You will look more energetic, vibrant and healthy while feeling calm and relaxed! According to Chinese Medicine, wrinkles begin internally from a constitutional imbalance in the meridian system. Constitutional imbalances can occur from a deficiency of Qi (energy) or blood or a combination of both. Qi and blood circulate throughout the body providing nourishment, support, and energy to every cell, tissue, muscle, and organ. The Qi and blood travel on a meridian pathway system used in acupuncture. Strengthening and stimulating the flow of the meridian system reduces the signs of aging by promoting health to the skin and muscle tissue in the face and neck. As we age it becomes more difficult for Qi to flow upwards to “lift” the face. This leads to inadequate muscle tone, and over time, wrinkles and sagging skin. We will help you identify the factors contributing to your constitutional facial weaknesses including diet, proper nutritional supplementation, hormonal balance and environmental factors. Facial acupuncture at Isthmus addresses more than just your face. Chandon Williams was trained by world-renowned facial acupuncturist Mary Elizabeth Wakefield, LAc, LMT, MSOM. Chandon has personal experience with many skin conditions such as eczema, acne and sensitive skin, which sparked her interest in pursuing facial rejuvenation acupuncture therapies. Schedule your relaxing facial rejuvenation acupuncture online today!